Bossaball has collaborated with a wide range of different brands worldwide, which have found in Bossaball an ideal partner to show their products. Our professional demo teams attract media and crowds with their spectacular moves and invite the assisting public to join the game and feel the experience for itself: a convincing mix for a brand activation, since Bossaball enables direct engagement with the consumers in an attractive, inclusive and interactive way. Find in the following four examples of Bossaball’s past in the branding world. Bossaball Tunisia started a long-term collaboration with French multinational telecommunications corporation Orange in 2015. The first tour served as a perfect benchmark for future activations and resulted in two more beach tours in 2016 and 2017 plus three university tours in the winter months. For both occasions, Bossaball Tunisia was able to get multinationals Huawei, the largest telecommunications equipment manufacturer in the world, and Red Bull on board. Both the indoor and the beach summer tours followed the same idea of combining the exhibitions of the professional Bossaball players with open tournaments, which were focused on local volleyball teams. The winners of each competition advanced to the finals, where exclusive products of Orange and Huawei, such as tablets and phones, and 10.000 Tunisian Dinar, around 3.500 €, first prize money were at stake. Orange has shown a long-term commitment to the new sport due to the possible massive presence on the beaches and in the universities. On top, the opportunity to build brand loyalty both with the participants of the tournament and the spectators made the tours a successful brand activation for the telecommunication company. Click here and check the press release overview of the 2016 beach tour. Professional Bossaball players put on a show during the Orange brand activation on the Mediterranean beaches of Tunisia. 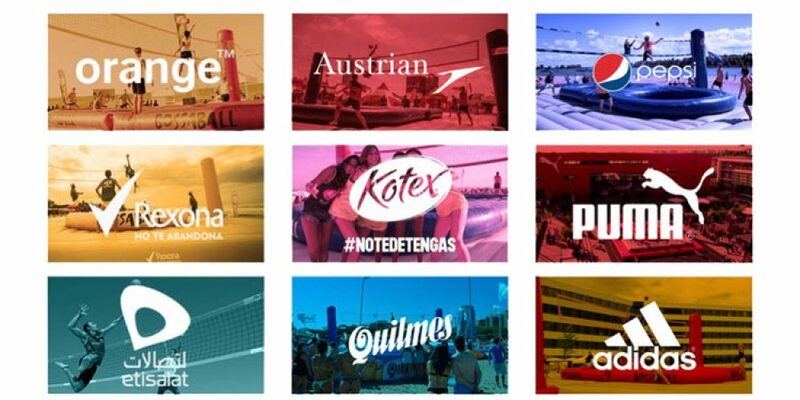 Bossaball Argentina joined forces with multinational brands Rexona, Kotex, Quilmes and TV channel TNT Sports. The brands were able to show their products in a participative way and get the people moving on the beach during the summer months. Rexona, the world´s best-selling deodorant brand, held a one-week promotional tour featuring our demonstration players in Mar del Plata, a beautiful beach on the Argentinian coast. The tour combined shows from our players and the workshops led by our instructors enabled Rexona to expose its newest product and invite people to try their new protection technology during an intense session of bossaball under the Argentinian summer sun. Rexona promises 10 times more protection with its newest deo. The Bossaball Kotex crew during the brand activation tour. Quilmes is an Argentine brewery founded in the Buenos Aires province. Since its beginnings in the 1920’s, the beer has become something of a national symbol. Just as traditional as the beer itself, are its summer activations. 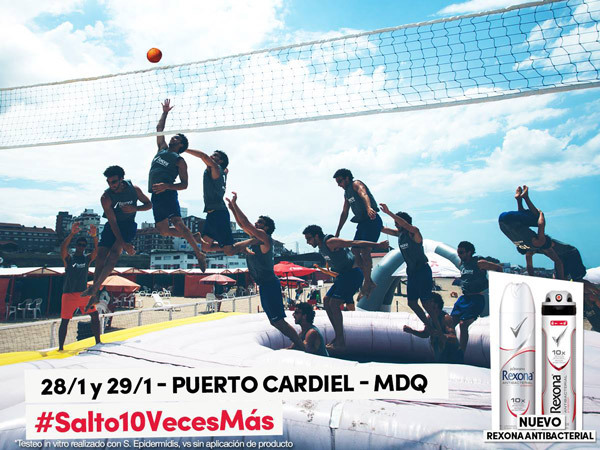 In the summer of 2014, Bossaball and Quilmes partnered up and brought a refreshing experience to the famous coastal line of cities as Pinamar and Mar del Plata. Bossaball set-up on the beach during a Quilmes brand activation. TNT Sports held a TV channel brand activation with Bossaball on the Argentine coast. TNT Sports, spin-off of the successful main channel of TNT, is the new channel of Turner Argentina that transmits the Argentine First Football Division for the entire country. 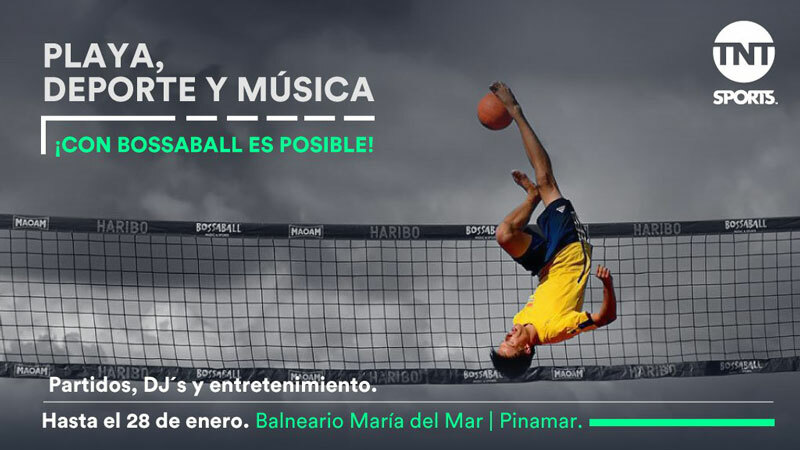 The place of the Bossaball activities in the summer of 2018 was the Parador María del Mar, located on the beaches of Pinamar. 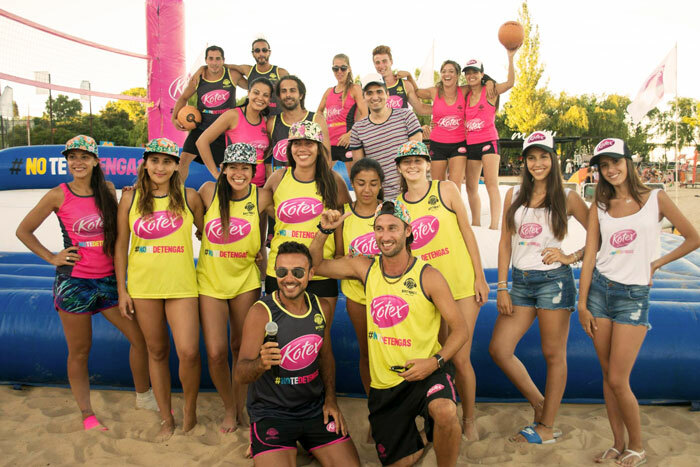 The event involved exhibitions of the players of the Argentine National Team in order to capture the interest of the beachgoers, open tournaments for the public and classes to learn and improve the skills on the Bossaball court. The results were rewarding for the four brands, since they were able to create a positive experience around their products while the participants were enjoying their summer holidays on the beaches. Bossaball at the FIVB Beach Volleyball World Championships 2017 were 10 days of action under the Viennese summer sun, which entailed clinics for all the Austrian beach volleyball fans and two Bossaball tournaments with the teams from Colombia, Belgium and the dominant line-up from the Netherlands. Two Bossaball courts had found its spot right next to the especially set up stadium on the Danube Island – an amphitheater for 10,000 beach volleyball fanatics. The Bossaball activities did not only entail tournaments with the professional players, but as well workshops for all the Austrian beach volleyball fans were offered. Bossaball had found Austrian Airlines as a sponsor for the event and throughout the ten days, more than 2,000 participants signed up for a prize draw for two flights to Los Angeles. All of those 2,000 visitors enjoyed a session on the Bossaball courts, where they received an introduction into the sport by the Dutch, Belgian and Colombian players. Austrian Airlines was able to obtain personal data of the participants while showing its brand at a perfect location during the Beach Volleyball World Championships, associating the brand with the innovative sport Bossaball. The Dutch and Belgian team battle for the win in the sponsored event by Austrian Airlines. Confectionery group HARIBO started collaborating with Bossaball Netherlands in 2010 and has since then kept a similar, but advantageous approach for their brand activation strategy. Bossaball Netherlands developed tours in order to bring the new sport to schools and the widely spread Dutch campsites. Both schools and campsites can book a day with the innovative activity for their students and visitors. The collaboration is carried out with a split funding, which means that the event budget is shared between the venue and HARIBO as a sponsor. This procedure allows to achieve two objectives. First, thanks to the financial support of the brand, the schools and campsites can offer an extra activity at low costs. Secondly, because of its sponsorship of this project, the brand is able to enter new markets. Of special interest is the educational market, since marketing activities and brand activations towards youngsters are not easily targeted. HARIBO and Bossaball Netherlands have carried out brand activations on beaches, campsites and in schools.